When building a "bracket of integrity" there are certain rules I follow. Except of course if I'm in Vegas or in a real high-stakes pool. Of course these are rules I created, and I don't necessarily adhere to item #2 "Free your mind of any personal prejudice." 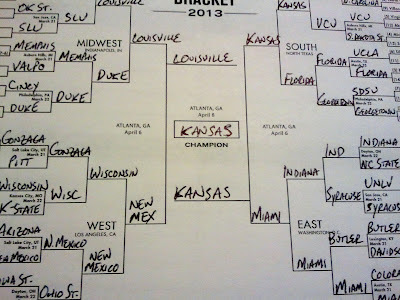 I pick Kansas and Kentucky to meet in the finals nearly every year. Except this year when Kentucky is not applicable. So in keeping with the teams in the conferences I cover with frequency, I had chosen Kansas vs Florida before Championship Week. Now at best it's a Final 8 matchup. But Florida, while still very dangerous, faces a serious uphill battle. To get to a Regional Final against against the Jayhawks, they'd need to beat UCLA and Georgetown on the way. But the Gators have nobody to blame but themselves since their lackluster play put them in this predicament. 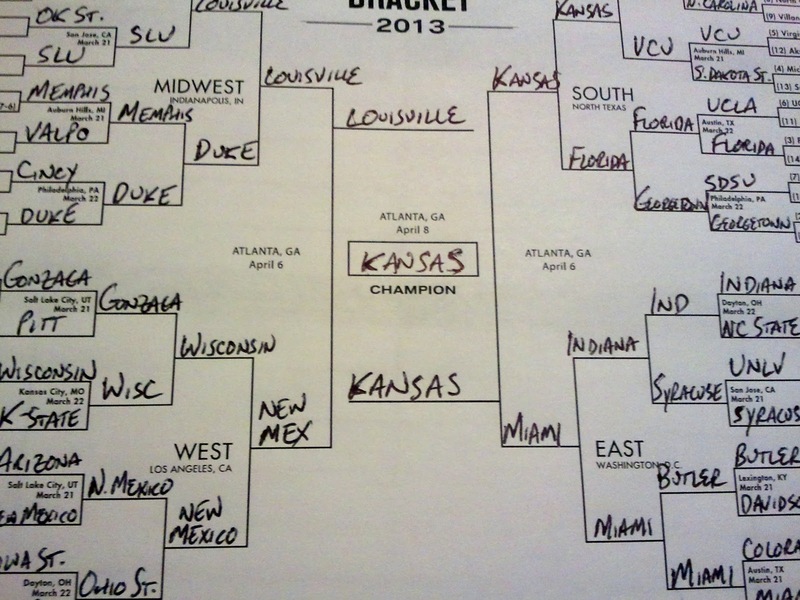 Instead I have Kansas against another Kentucky team, Louisville, with Kansas winning it all. If I were to free my mind of personal prejudice, I would see Kansas for what it is: A team with possibly the most talented player in the country (Ben McLemore), an imposing, impactful defensive presence (Jeff Withey), and a senior backcourt (Travis Releford & Elijah Johnson). They also have a coach who's been there before, winning it all in 2008 and reaching the final game just last season. > Down on the Big Ten. Illionis is a #7 seed. Really? Got none in the Final Four, and I have Michigan State and Michigan going down in major early-round upsets. Indiana is a force and Wisconsin is a threat, but as a conference I'm not seeing it. > Big upsets. Familiar teams lurk, and I got two #14 seeds moving past their first game: Davidson over Marquette, and Valparaiso over Michigan State. I also like #13 South Dakota State over #4 Michigan. > New blood in the Final Four. Miami (#2) and New Mexico (#3) may not have been there before, but their coaches have. They are every bit deserving of these seeds and have veteran teams. Oh yes, then there's the alma mater. Got Syracuse beating Montana and UNLV before losing to Indiana in the Sweet 16. So there it is. Set your watch to it, print it out, and call it in. Just don't point the finger if I'm wrong. How's that for integrity?